The India-bound Citroen C5 Aircross underwent crash tests from Euro NCAP recently. It scored an overall 4-star rating (5-star rating being the highest) in these tests. The Citroen C5 Aircross comes with a lot of standard safety equipment. For front crash protection, it packs frontal airbags, belt pretensioner and belt load limiter. For side crash protection, side head airbag and side chest airbag (only driver & passenger) are included. Other standard features include front and rear Seat Belt Reminder, ISOFIX, AEB (excluding cyclist detection), Speed Assistance System and Lane Assist System. The Citroen C5 Aircross’ scorecard reads 87% in Adult Occupant Protection, 86% in Child Occupant Protection, 58% for pedestrian safety and 75% in safety assist. Do note that Euro NCAP has higher standards compared to Global NCAP, and so, even a 4-star rating is quite impressive. Global NCAP takes into account only Adult Occupant Protection, Child Occupant Protection and basic safety equipment. The French C-SUV is likely to achieve a 5-star rating from Global NCAP. 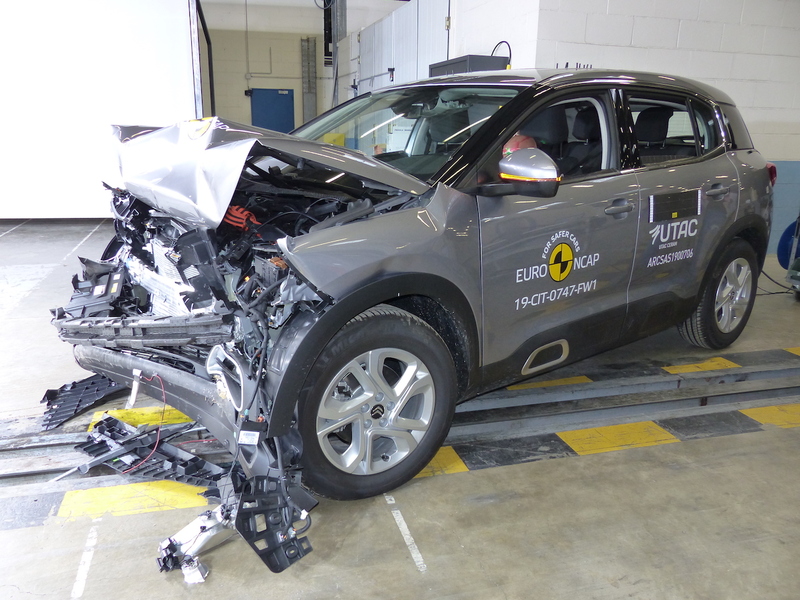 To read the complete report from Euro NCAP on the crash tests of the unit featuring standard safety equipment, download it from the source link given at the end of the story. Groupe PSA will launch the Citroen C5 Aircross in India in 2020, by the end of the calendar year. It will be the first-ever Citroen model in our market, where the French conglomerate is making a comeback after two decades. The company, along with its JV partner CK Birla Group, will assemble this SUV from knocked-down kits imported from the Rennes-La Janais plant (France) in Tiruvallur, Tamil Nadu. The Citroen C5 Aircross’ scorecard reads 87% in Adult Occupant Protection, 86% in Child Occupant Protection, 58% for pedestrian safety and 75% in safety assist. The Citroen C5 Aircross will compete with the likes of Jeep Compass and Hyundai Tucson in India.